As any fashion week street style star will tell you, no outfit is complete without the latest designer ‘It’ bag. A Chanel bum bag slung across your chest, or a beautiful Hermes Birkin nestled in the crook of your arm will really set the flashbulbs popping, which is why bloggers and Instagrammers are increasingly try to outdo each other with their accessories choices. Now, Louis Vuitton has unveiled quite possibly the most attention-seeking bag ever, and fans are in awe. 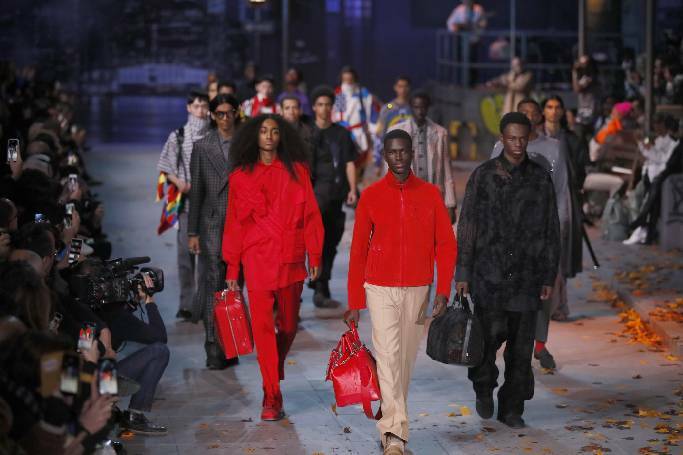 In Paris yesterday, during the autumn/winter 2019 menswear show, the lights went down and on came a handful of models, two of them carrying black monogrammed bags that appeared to glow in the dark. The Keepall bags, designed by artistic director Virgil Abloh, actually use fibre-optic technology to create a constantly changing rainbow effect. A photo of one of the bags shared by the brand has already garnered more than 243,000 likes (and that number is rising rapidly) as well as 1,400 comments. The vast majority are in praise of the colourful creations. “Virgil has taken it to a whole new level,” wrote Noah_gochnour. “Take my money,” said Aboardtheship710, and the reaction on Twitter was just as effusive. That new Louis Vuitton glow in the dark duffel bag is ! Virgil SNAPPED. I need!!! “Want it but can’t afford it,” commented Instagram user Kenfriedman1982, echoing the thoughts of hundreds of other users, even though the price of the bag hasn’t yet been revealed. If I See Anyone In NYC With That Louis Vuitton Glow Bag, You Are Getting Robbed. Indeed, with no details on where or when the bags will be released, some people are are worried they won’t be able to nab one at all. “Make sure regular joes like me can buy this instead of them not releasing it and selling only to VIP, I would appreciate that, thanks,” commented Erickane2. Others are resigned to the fact the only way they’ll be seeing the fibre-optic Keepall is in pictures. “Beyond major!! Can’t wait to see this on the street style set!” wrote Anchyi on Instagram. Which begs the question, if the multi-coloured monogram is only visible in the dark, how will they show them off at fashion week?